Parsley is one of the most nutritious plants we have – so if you never grow anything else, grow some parsley! An added bonus is that it is the most versatile plant for cooking with – I know I use it just about ever day, so there are an infinite number of ways of getting that green goodness into you. 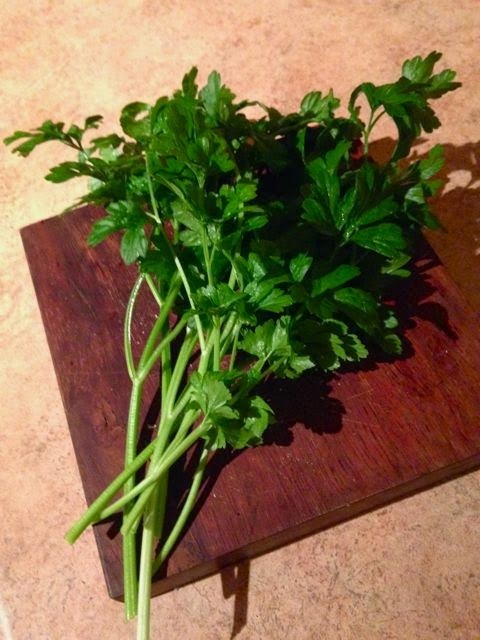 I was brought up with parsley, but we hardly ever ate it, it was just used as a garnish – usually with a slice of orange! This was always the curly leaf variety and my parents grew it in a mixed border with flowering annuals – I only discovered the flat-leaf variety when I came to Sydney in 1970’s and had my first tabbouleh salad in a Lebanese restaurant. My attitude to parsley changed instantly and I have grown some, wherever I have lived, ever since. It is very easy to grow, prolific and I love its emerald green colour in the garden and versatility in the kitchen. My back garden, where I grow parsley all the year round as part of the perennial border. There are more than 30 different varieties of parsley but the most easily identified are curly and flat-leaf. To me the, the flat-leaf variety has a superior flavour and texture – stronger, nuttier and sweeter. I also find that the curly variety is harder to eat – the curly bits tend to catch in the throat! 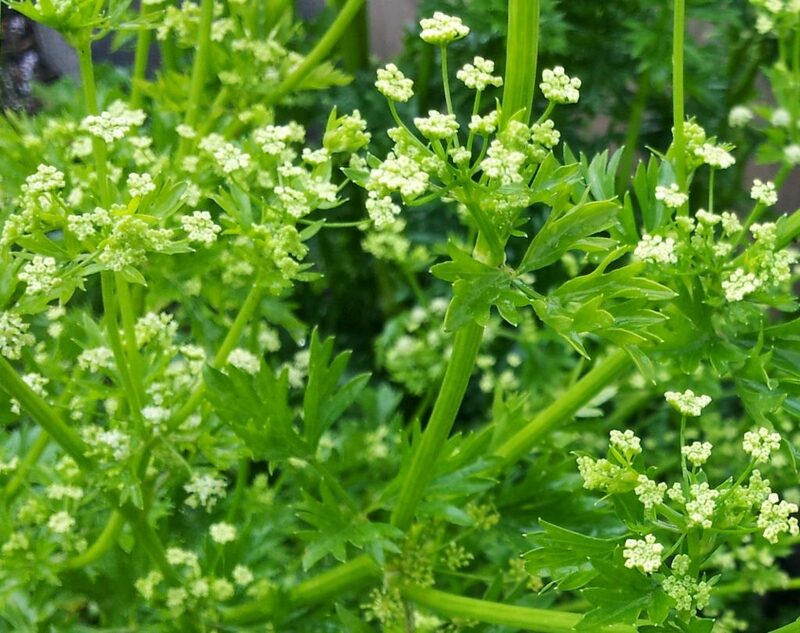 Flat-leaf parsley, also known as Italian parsley, is a hardy biennial, native to the Mediterranean that has been grown for more than 2000 years – originally for medicinal purposes and later for culinary use. 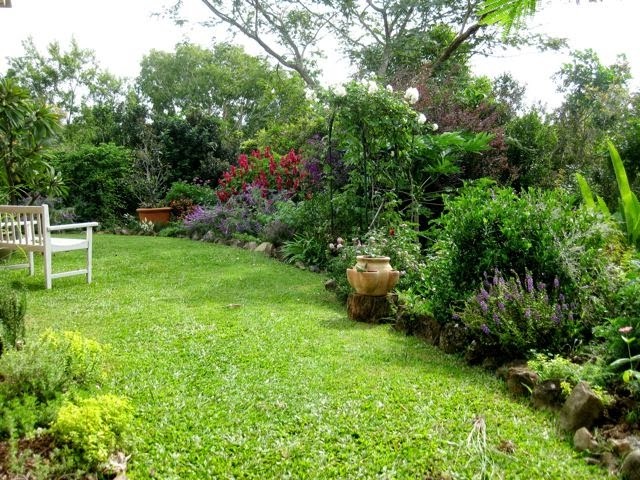 If you are a gardener, you would be familiar with perennials that return from year to year, and annuals that only last for one season. Parsley belongs to a third group, called biennials, that need two years to complete their cycle of growth and setting seed. In the first year it will only put on leaf; in the second it will start to produce flower stems – the continued production of leaves can be prolonged by nipping off those stems as soon as they appear. However, I always allow some to flower as they are the most marvelous insect attractant and companion plant. Being part of the carrot family, they give off that distinctive scent that helps to confuse and deter insects that may be looking for a meal in the plants around parsley – particularly anything in the cabbage family (brassicas). So plant parsley throughout your garden. Parsley is grown from seed and said to be hard to germinate – though I can’t say I ever have that problem as it pops up as self-sown plants all over the garden. If you are having trouble germinating the seed, try soaking it in water overnight. Sow seed in containers and transplant into the garden as seedlings. 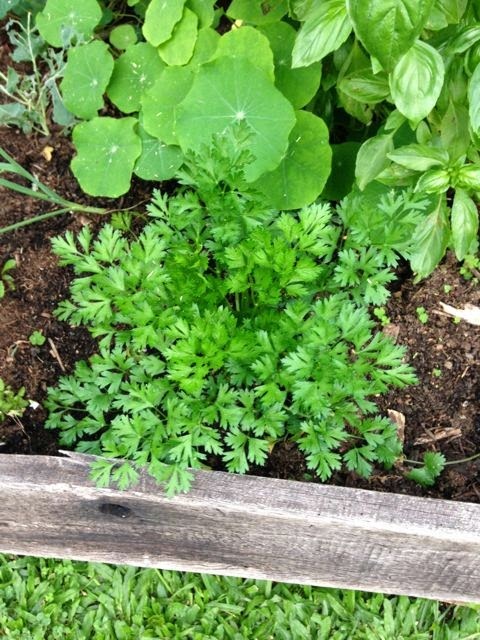 I prepare for planting the same way as the rest of the vegie garden – parsley loves rich soil that doesn’t dry out too quickly, so add some compost. Parsley also does well in pots – just make sure your container is deep enough as parsley has a long tap root. I have had success in growing parsley in old olive cans – just make sure you put some holes in the bottom and don’t let them dry out. Parsley likes morning sun, but not intense heat all day. It will not grow in full shade. Fresh parsley is highly nutritious. Just one cupful easily covers your daily vitamin C requirements and about a third of your vitamin A needs. It is the highest food source of vitamin K. It is also a useful non-dairy source of calcium, especially for anyone who eats few dairy products. It also contains half of the recommended dietary intake of iron (20% for pre-menopausal women). Just 25g of parsley provides more iron than a 200g pork chop. So you can see that half a cup of parsley, added to your meal, may just about contain more vitamins and minerals than the meal itself? 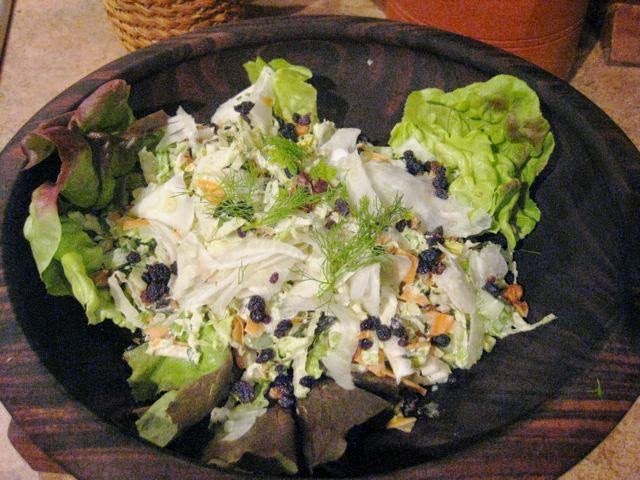 All this talk about parsley made think about a good salad for dinner last night. This is it! Toss it all together and serve. I also drizzled with a little olive oil and a squeeze of lemon juice. I served it on a bed of lettuce with a salmon quiche. NOTE: The stems of parsley are more nutritious than the leaves, so don’t throw them away!. IMPORTANT NOTE: Although parsley is a rich source of folate, herbalists advise against eating more than 15g per day during pregnancy, because it is said to stimulate uterine contractions.